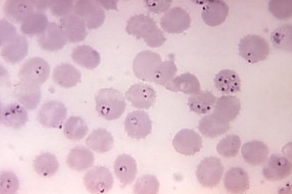 Drug-resistant forms of Plasmodium falciparum, the deadliest species among malaria parasites, are able to infect the type of mosquito that is the main transmitter of malaria in Africa, according to findings from scientists at the National Institute of Allergy and Infectious Diseases (NIAID), part of the National Institutes of Health, and global partners. The discovery suggests Africa—where malaria will cause an estimated 400,000 deaths in 2015—is more at risk for drug-resistant malaria infections than previously thought, which could further compromise efforts to prevent and eliminate the disease. Plasmodium falciparum parasites resistant to artemisinin, the main drug used to treat malaria, have been rapidly spreading in parts of Southeast Asia, making it difficult to treat and control infections there. Malaria experts are concerned artemisinin-resistant parasites could spread to Africa, but until now, there were no scientific indications to suggest that these parasites could infect Anopheles coluzzii (formerly Anopheles gambiae M form) mosquitoes, the species largely responsible for transmitting malaria in Africa. To investigate the transmission potential of these parasites, scientists infected various mosquito species from Southeast Asia and Africa with artemisinin-resistant parasites from Cambodia in a laboratory setting. They discovered the parasites easily infected Southeast Asian mosquito carriers Anopheles dirus and Anopheles minimus, as well as A. coluzzii. The scientists also discovered a shared genetic background among artemisinin-resistant parasites that may enable them to infect diverse mosquito species by evading their immune systems. The ability of artemisinin-resistant parasites to infect diverse Anopheles species may help explain the spread of resistance that has occurred in Southeast Asia in recent years and poses challenges to preventing the spread of resistant parasites to Africa, the authors write.